This rural holiday home with sauna and Jacuzzi has nice and rustic furnishings. It's located at 5 km from Vielsalm and features a garden with all-year heated indoor pool. Great for families. This holiday home has a large living room where, in addition to the seating area, you'll also find a football table. There is a fully equipped, open-plan kitchen, and a large dining room with fireplace and seating for up to 32 people. The sauna is located in the house and the Jacuzzi in the small cottage in the garden. This is where you'll also find the indoor swimming pool with removable roof. The garden has several patios, a barbecue and a playground for children. 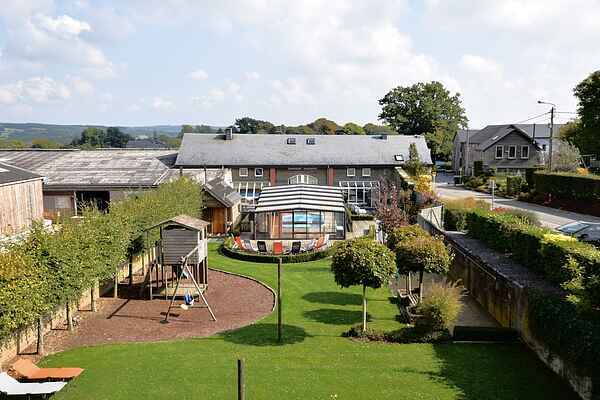 A second playground with trampoline and a football pitch is shared with another holiday home. The region offers great hiking and biking trails, and there's a tropical swimming pool in Vielsalm (5 km). Other activities and attractions include the ski slopes of Baraque de Fraiture (13 km), the waterfalls of Coo and amusement park PlopsaCoo (20 km), Stavelot Abbey (20 km) and La Roche-en-Ardenne (31 km).